• Why did you choose the Wall Street Journal? • Did you run the ad in any other print or online publications? • What kind of response have you gotten, either in the mainstream media or social media? • Can you tell me how much you paid for the ad? • Any plans to run more ads? John, the day after the ad ran I received a call from Congress asking me to give testimony before the (Full) House VA Committe on June, 25th in Washington. I would say the ad was pretty effective. We would say the same thing. 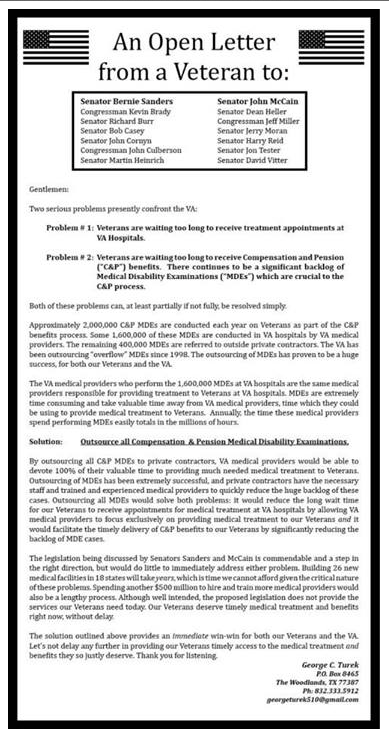 This entry was posted in Uncategorized and tagged Bernie Sanders, C&P benefits, Civilians Who Run Full-Page Ads in the New York Times, David Morefield, David Vitter, Facebook, FluffyShotMe, George C. Turek, Harry Reid, John McCain, MDEs, Twitter, V&A, Veterans Administration, Wall Street Journal. Bookmark the permalink. So the key to a quick response from Congress is a) run a NYT ad, or b) propose another way to funnel public money to private hands?